Argentinean prop Rodrigo Roncero has developed a reputation as one of the world game's most destructive scrummagers. He made his international debut in 1999 in a 44-29 loss to Japan in Chichibunomiya, whilst playing at amateur level for Deportiva Francesca in Argentina. Roncero made the switch to professional rugby in 2002 when he signed for Guinness Premiership side Gloucester. During his time in the Premiership Roncero regained a spot in the Pumas side, playing three tests during 2002 and securing a place in Marcelo Loffreda's 2003 World Cup squad. Roncero played twice at the tournament in Australia, in convincing wins over Namibia and Romania during the group stages. In 2004 Roncero continued to hold down a place in the Argentina squad, playing five tests during the year including his first against the All Blacks in Waikato. 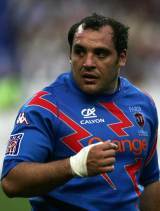 Also in 2004 Roncero swapped Gloucester for Paris and French giants Stade Francais. Roncero has become a fixture of the Stade front row and packed down in their extra time defeat to Toulouse in the 2005 Heineken Cup final. Roncero added a further five caps to his name in 2005 and was part of the Argentina side that recorded a series win over Wales and narrowly lost 25-19 to the All Blacks in 2006. Heading towards the World Cup in 2007, Roncero was in the form of his career. He continued this through the tournament, playing in every game of the Pumas' remarkable march to the semi finals. Roncero was considered by many to be the outstanding prop at the tournament, and formed part of a fearsome Argentinean scrummaging unit alongside Mario Ledesma and Martin Scelzo. His brutal power in the tight and deceptive turn of pace make Roncero the complete modern prop forward. In 2008 Roncero was named in the Argentina team to face the Springboks in honour of Nelson Mandela's 90th birthday. Despite Stade Francais announcing a host of departures at the end of the 2010-11 season, Roncero will remain with the Parisian giants for the 2011-12 season. Roncero will form a key part of the formidable Pumas front row in the 2011 World Cup having been named in their 30-man squad.